On 10 Oct 2014, a protest rally was planned in Dushanbe per announcements the leader of the oppositionist Gruppa 24 Umarali Kuvvatov made on social networks. 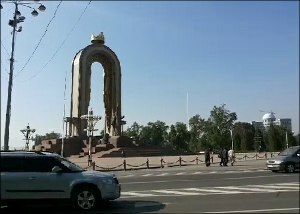 The group’s plans included people taking to streets and waving “Tajikistan demands changes,” “Tajikistan without Rakhmon,” “Fair elections,” “Life with dignity” slogans. - Do you think people are informed about this rally? - Even those who did not read news or watch TV, because they work from morning to evening, are now aware that something is about to happen. The only [source of that information] are the authorities in panic. - Is the Internet accessible in the city? - It is. [However,] online social networks are blocked along with some other websites, but people can still access them, using proxy-servers. Although it is impossible to send short messages, placing phone calls is possible. - Could one say protesting attitudes are suddenly on the rise in Tajikistan? Not necessarily today, but in general. - Of course, the Tajik nation is very discontented with these authorities. Many [unresolved] problems accumulated over the last 20 years of [the current] unchanging rulers. Nothing is being done for the commoner. But there will not be rallies – people are not ready for that just yet. Indeed, nobody showed up for the rally on the Dusti Square. A live video feed on Asia Plus news agency’s website confirmed just that: a very peaceful image of a deserted square. - Nothing is happening. Security measures have been stepped up in connection with some announcements in social networks urging to participate in an unsanctioned rally. But nobody applied with the Dushanbe City Hall for permission to hold it. So there is no rally. All these rumors are based on word that someone was calling the people to protest. - But that is [precisely] the reason why nobody can now send short messages or access the Internet. - That is correct. Not only social networks are blocked, but news websites are too. However, the state agency for communications denies its involvement in the case. As usual, “the service has nothing to do, plans to investigate and identify culprits…” Most probably, it was someone’s direction to limit the communications. - What is the overall mood like in the city? - People are outraged, but see no way out of the situation; they have to put up with this humiliation. - How justified are calls to protest and rally in Tajikistan? Will they fall on hearing ears? - I am not entirely sure, but the security services’ reaction speaks to the fact that the authorities are certain these calls will get some feedback. The life is difficult; especially so in the regions where electricity blackouts are being implemented. Employment is scarce and people are, therefore, forced to travel abroad to seek jobs. I think it would be better if they thought about these social problems instead of limiting rights to freedom of expression. - Then why, do you think, people did not take to streets today? - Those who urge to participate in rallies are unable to realistically assess the current situation in Tajikistan. People here are only concerned about daily life, not some political protests. And those conformably residing somewhere in the West and urging to take to street do not realize that if an average person does express their protest out loud, then they could be risking their very lives. Why everything is calm in Khalil Kayumzod’s words. - Nothing happened, everything is calm. This was some kind of a joke on the part of foreign bloggers. I read Facebook and nobody currently in Dushanbe is saying, “Let’s go, guys.” On the contrary, they write not to fall prey to provocations. Power-wielders are still patrolling streets [as part of] heightened measures in the streets. However, nobody denies there are many reasons for discontentedness. Mr. Kayumzod wrote on his Facebook page: “… I returned to Dushanbe from Penjikent a couple of days ago… Yes, the Chinese are constructing roads there. But the quality of life is not improving, and the authorities are doing nothing to resolve problems the citizens are facing. If I list all those problems, I would end up crying and you would get bored before you reach end. So I will only highlight the most noticeable ones: nobody watches the state TV stations, even news are watched on Euronews and other foreign TV channels; mostly they watch Turkish soap operas, and satellite dishes are mounted on almost every single house’s roof. Youngsters come back there for a couple months from migration to visit their relatives and after that: ‘Hello, Mother Russia, I am back!’ Those with higher levels of education prefer [traveling to] Europe, because the image of Tajiks in Russia is that of a labor migrant. When it became clear that the rally was a failure, we called Umarali Kuvvatov to ask, “Why did not your supporters come to the square?” The response was quite an unexpected one. - Wait a minute. Are you saying that the Tajik authorities have purposely flew 800 fighters in from China so they disperse a rally? Then why all these training exercises with the 201st division? - Talks on the Chinese participation were held under big secrecy. These are special units that can be very active; they are disciplined. You know how they dealt with the rally in Urumqi. The ministry of internal affairs and the committee for security of Tajikistan would not shoot at the rally participants, but the Chinese forces [in question] could use that. This scared people. Umarali Kuvvatov has earlier posted a video on his Facebook page and called his supporters to a jihad. “Emomali Rakhmonov is… against Allah. I am calling you to a jihad” (3.16). “Dear brothers… We must know that jihad is the only way to freeing our Motherland” (6.02). - How many supporters do you have in Tajikistan? Approximately? - Very many. Ninety-seven percent of people in Tajikistan want to change the regime. But the people are scared in general. You know the kinds of tortures taking place in our prisons, how many people were killed, what Zayd Saidov was imprisoned for and his lawyers are locked-up. The tyrannical regime is brutal, and people do not know the way out. We had no financial resources – the opposition did not address either the Americans or the Europeans or the Turks or any other governments. We thought our resources would suffice; the issue of [presumably the scarcity of] resource arose. - I read your interview in Russkaya Planeta. Why are emphasizing Rakhmon’s ethnicity so much? Are you not afraid to associate an apparently nationalistic aspect your movement? You declare Tajikistan is for Tajiks; how come you are not afraid this would discourage international sponsors [from getting involved]? - Why I said so? If Rakhmon, upon assuming the post of the president, had openly spoke about his ethnicity, there would be no problem. If someone hides their ethnicity and sells Tajik lands using that, then aggression grows. How so? The territory of Tajikistan is being sold for the third time and the people of Tajikistan are unaware of this. - Do you think if the president were [ethnic] Tajik, he would not sell the land to China? - I think we would have been able to use clan and blood relations to ask him: What is your justification for selling this land? Secondly, we know that Rakhmon’s power is based on a clan, a family and generals – they are all of his ethnicity. Many natives of this country are leaving the state. And I have to defend my people because I can see that we are losing the nation. Thus, an announcement about a rally that nobody turned up for became an efficient PR campaign for Gruppa 24 and serious headache for residents of Tajikistan: those in the northern parts were cut off the Internet, while others lost access to news and social websites, and everyone lost the capacity to send short message for two days in row and were so scared, they feared letting their children go out to play. This trial attempt of a rally shed much light on many things. The authorities do seriously believe that a large-scale protest can be ignited in the country and display maximum preparedness to brutally clamp down on anything of that sort. The oppositionist Gruppa 24 decided it would play two most effective and most dangerous cards: ethnicity and religion. In an impoverished country with no jobs and justice, such ideas find supporters rather quickly.